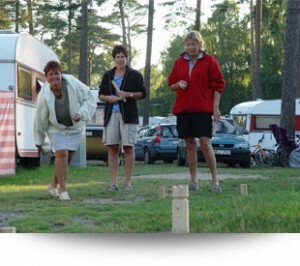 Ystad Camping now open all year around! For information click on Camping or visit us on Facebook. you can not get it better than us. With approximately 200 m to one of Sweden’s most beautiful beaches so you have all the opportunity to get long, lovely bath. Sandskogens campground offers 380 campsites where no one is ever the same. 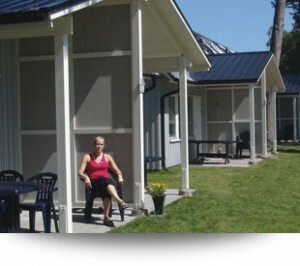 20 well year-round cabins with kitchen, toilet, shower and TV, and 12 cottages with kitchenettes. 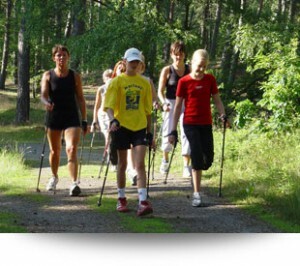 The campsite is wonderfully embedded in the nature reserve Sandskogen. ? Down at the beach you will find our fresh kiosk and ice cream parlor. Here you can enjoy meatballs, sausages, burgers and ice cream but especially our beloved freshly baked waffles with jam and cream. There is also a nice mini golf course for all eager vacationers. Here is something for everyone. Within four kilometers you will find Ystad Golf Club’s 18-hole course, Nybro Strand’s heated outdoor pool, Ystad Tennis Club, long walking and biking trails, fishing spots in Nybroån, Ystad Riding Club, newly built indoor pools etc. Our nice and fresh year round cottages are open year round. Children are our most important asset! Have the kids an enjoyable and fun stay with us makes it even a good stay for the parents! We cooperate with Ystad Golf Club. More information is available at reception. Ystad is known for its beautiful inner city and we also have the nation’s oldest theater. Take time for a guided walk in the footsteps of Wallander in Ystad itself. Want to go on a day trip so why not take the train and suddenly you’re on the Stroget in Copenhagen or on the square in Rønne. Last but not least we want to tell about all our great Osterlen with all that it offers. Everything from Ales Stones and Stenshuvud to Iceland Horses and gourmet cuisine.